They’d say he was a fine man, a hero. Lucky too. A finger lost at Tobruk, a shard of Panzer shrapnel on a Normandy beach, an angry cutlass that still itched seventy years on. When the boys were small, they’d run their fingers down the crimson furrow from brow to chin, as he told tales of Bren guns and night raids, but never mentioned the friends cut down around him as he stumbled through gorse while fate spoiled the sniper’s aim. Sometimes he’d weep and demand to know why he’d been spared when better men had not. As his mind had gone, the stories stopped but the brothers still loved their Grandpa. In the Brookes household, weekends were special. And they would all remember this Sunday, this warm, blue Sunday, taking an old-fashioned breakfast together. ‘Should we tell him?’ Hillary whispered to her husband. Her father, medals pinned to his pyjamas and gleaming in the early June sun, gazed into yesterday, oblivious to the chatter around him. Still in Primary yet quicker than his older brother, thought his mother, wrestling with the dilemma of truth. Was she a coward or did she just treasure their innocence too much? It would be gone soon enough, just as her dreams of somewhere in the country and a decent income had ebbed away like the blood in the veins of their marriage. They were gone in an instant, brothers in arms on a mission. 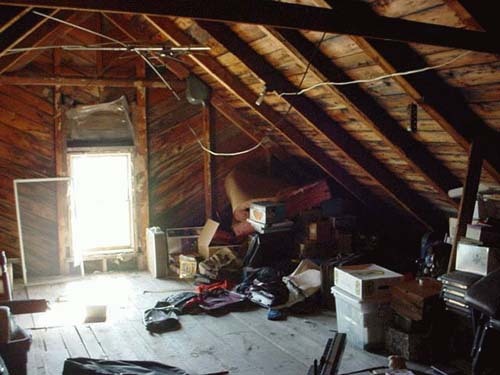 The garage was huge with a vast loft running its length, stuffed with the precious, abandoned detritus of generations. The boys loved it up there, loved the dark damp corners that harboured monstrous spiders, the musty smells, the mountains of dusty crates and boxes that lay locked and untouchable. They knew they shouldn’t have opened it and it took some effort, but finally they raised the heavy steel lid. Inside lay a treasure trove of khaki belts, boots, rusting bayonets, a crumbling rubber gas mask, letters bound in pink ribbon. And asleep at the bottom, a clip of five long rifle bullets. There is a side to children unknown to their parents. A risk-taking hand of curiosity that guides loving sons to explore and experiment, smothering in a moment all conscience, danger or guilt. Later they would say they didn’t know why they did it. Liam drew back, his face pale in the weak pool of torchlight. ‘Isn’t that dangerous?’ he asked, his voice small. It wasn’t difficult. The workbench had a giant vice bolted to its side into which Gary slid the cold, ancient brass sleeve. With the heavy lead tip pointing at the old oak doors, he carefully wound the vice handle until the cartridge, long as a man’s finger, a grandfather’s finger, sat snug in its jaws. Later, Liam would say that he’d found the nail but wished he hadn’t. Gary would admit that it was he who’d lifted down the hammer from the tool shelf. They’d argued over who would hold the nail, who would hit it. In the end, the hammer proved too heavy for the smaller boy and Gary took it. ‘Yes, I swung it’ he’d weep. ‘But they were boys, just little boys’, their father would tell the inquest. A woman at the Post Office remembered hearing it, just after the church bell struck ten. Their mother heard the bell too, as she stretched to peg out wet sheets, might have heard the hot lead tear free from oak planks and hiss through the hedgerow, its presence far ahead of sound. Later, she’d find two neat holes in her blouse where it grazed her arm and carried on its half-second journey to the greenhouse. He didn’t see the sniper. They say you never do. But as Corporal Albert Selwyn Brookes left all pain behind, a lifetime of guilt slipped from his shoulders.